Location: At the end of an un-named minor road. On the south side of the northernmost lock of a 'staircase' of locks on the Caledonian Canal. 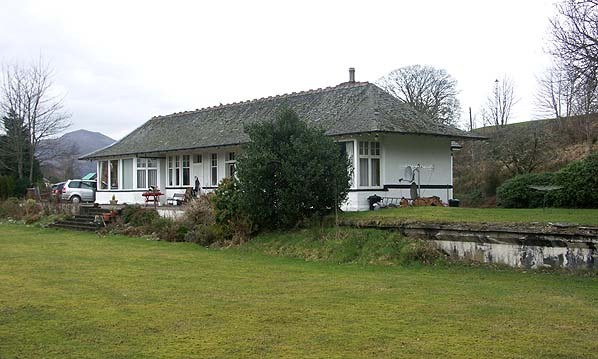 Present state: Station building and platform survive as a private residence. The stationmaster's house is also a private residence. Notes: The West Highland Railway was one of the last Main Lines to be built in Scotland. It is one of the most scenic railway lines in Britain, linking Fort William on the west coast to Glasgow. It was originally built by the North British Railway. Construction was authorised in 1899, with the Act being passed on 12 August and construction starting 23 October. 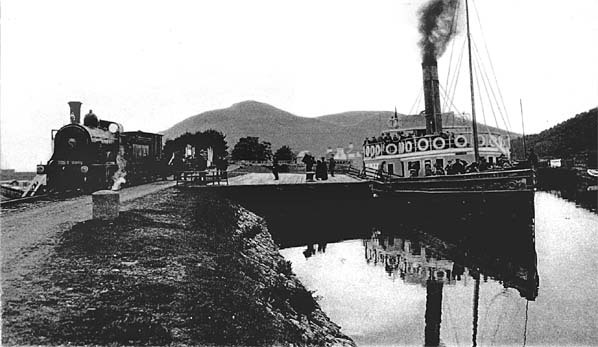 The following year the branch line to Banavie on the Caledonian Canal was authorised. The line was opened on 1st June 1895. The West Highland line was extended to Mallaig by means of the Mallaig Extension Railway. Authorisation was obtained on 31 July 1894 and the Mallaig Extension Railway opened 1.4 1901. On opening of the extension Banavie Junction at the junction of the Banavie Pier branch was renamed Mallaig Junction and Banavie was renamed Banavie Pier. With the opening of the Mallaig Extension Railway the service to Banavie Pier was reduced to summer use only although sometimes 'summer' extended into October. The service was irregular; at times train ran every day but the usual pattern was one train Monday, Wednesday and Friday to Fort William and one on Tuesday, Thursday and Saturday from Fort William. 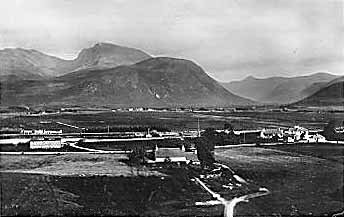 The West Highland Railway was absorbed by the North British Railway on 21 December 1908. The North British Railway was then absorbed into the London and North Eastern Railway at the Grouping in 1923. Banavie Pier station was scheduled for closure on 2nd September 1939 although the last train from the pier ran on 15th September 1939 and the last train to the pier ran on 16th September 1939. The station remained open for freight until 6th August 1951.